Cast: Ramai Te Miha, Stanley Knight, Leo Pilcher, John Gordon, A.J.C. Fisher, Peter Hutt, Rud Peterson, Selwyn Wood, Phoebe Clarke, Tom Moisley, Henare Toka, Rauriti Te Huia. Writer: Rudall C. Hayward from James Cowan's 'History of the New Zealand Wars'; Photography: Rudall C. Hayward, Edwin Coubray, Jay McCarthy; Sound Engineer: Jack Baxendale; Music: Alfred Hill; Editor, Producer, Director: Rudall C. Hayward. Star-crossed lovers, Robert and Ariana, are caught up in the New Zealand wars of the 1860s. Ariana is claimed by the Maniapoto people as one of their own and, despite Robert's chivalrous defence, is taken by them and must help them prepare for war. Robert likewise must do his patriotic duty and enlists to fight on the other side. He volunteers to ride despatch, thinking it may give him an opportunity to see Ariana again, which it does, but their joy is short-lived; Maniapoto women fight beside their men, and furthermore she is a Rangitira (noble) and will not let her people down. The climax is the siege of Oraku Pa where 300 Maori hold off 2000 troops for three days. The Maniapoto are defeated, but Ariana, although wounded, survives to be reunited with Robert. The film was shot in the area around Te Awamutu. Ramai Te Miha married Rudall Hayward, 3 years after this film was completed and became his active partner in many film projects until his death in 1974. New NTSC VHS copies were last selling for about $15us. No known source for PAL copies. It is available on an NTSC R0 DVD-R displaying the original 1.33:1 format with a mono English, and some Maori, language track. It is available for purchase from Amazon. Comparing this dvd with an original vhs, I saw no significant differences except that the dvd did not have the horizontal dropouts that are typically present with vhs. There are no extras and no subtitles. The film has been selected for restoration, as it is the last unpreserved New Zealand feature shot on nitrate film, but no release date as of August 2017. In 2006 Ramai Hayward was made a member of the Order of Merit for her services to New Zealand film and Television. Wairarapa Times report on the death of Ramai Te Miha Hayward.. 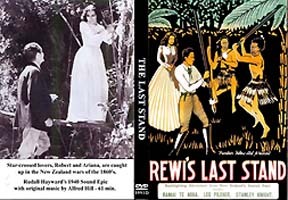 The sound version of Rewi's Last Stand in which Hayward was determined to correct the mistakes he had made in the 1925, silent film (see reference number F2290) of the same name. Like the earlier version, the film is heavily indebted to the historian James Cowan and his account of the invasion of the Waikato by the British during the war of the 1860s. The film takes its name from the famous battle of Orakau when Rewi Maniapoto and his 300 supporters resisted the advance of over 2000 Imperial troops during a siege which lasted for three days. Around this Hayward wove a fictional love story between a settler, Robert Beaumont, and Ariana, a young Maori woman. Released in Britain as The Last Stand the original negatives were cut to meet the British Quota system. Only the shortened version of the film is known to survive. The Last Stand was also the first New Zealand film to be shown on local television.